CEOs and managers who deploy a social intranet into their organization do so with good intentions. 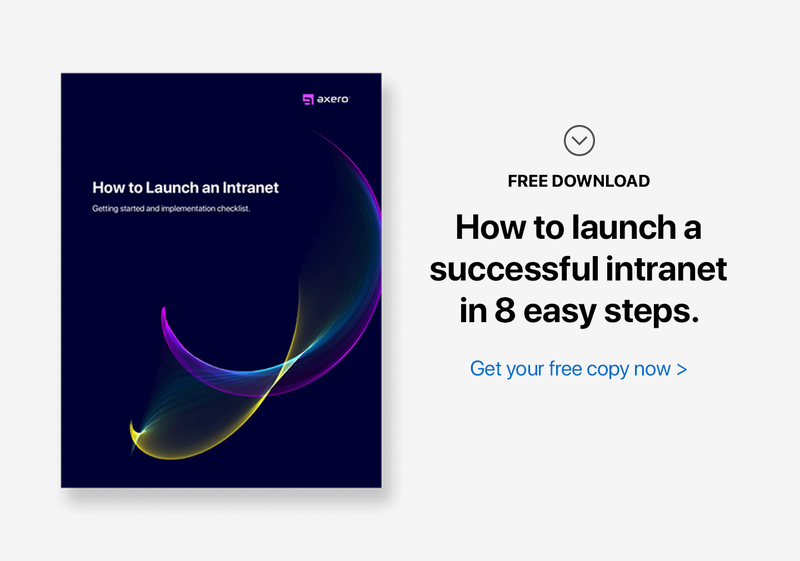 Most people think that intranet software will make life easier for employees or that productivity will go through the roof as soon as it's up and running, but this isn't always the case. There are plenty of reasons why intranets fail, and identifying them early-on is the best way to ensure that your company intranet doesn't suffer. While every company intranet is unique, some reasons for intranet failure extend to all industries and organizations. Here are 17 reasons why intranets fail, all of which can be avoided if you take the time to plan things out carefully. Developing a company intranet requires you to think about the needs of your organization, and it should be deployed to make daily processes easier. Sadly enough, user needs often go overlooked during the development process, which can result in an intranet that simply doesn't get the job done. One of the best ways to keep this problem from occurring is to hold a "focus group" early-on in the development process. Determine your intranet objectives and requirements ... and figure out what tools your users will need to do their jobs effectively and make the most of your social intranet. Your company intranet can be an excellent resource for information. Company guidelines, documentation, and other media files should be easily accessible, but if not kept up to date, an intranet will surely fail. Outdated information will do you no good. Archive old posts, and make sure that new content is timely and pertinent to the needs of your staff. The more relevant content that is created and updated in your social intranet, the quicker you'll increase employee engagement and motivation. One of the biggest challenges with deploying an intranet is getting employees up to speed. Large organizations have an especially hard time with intranet adoption, as not all companies give staff members a tour of the intranet. This is truly a shame, as a social intranet with low adoption rates won't be able to reach peak performance. Ensuring that every employee knows how to use the intranet to its fullest capacity should be one of the first things you focus on, and it doesn't have to take up a lot of your time. An intranet should serve as your company's central hub for productivity, a place where staff can log in and start making things happen. Because many employees use numerous programs on a daily basis, it makes sense to consolidate as many processes as possible within the social intranet. Consolidation of processes, like accounting, time-tracking, and project management, can help save your organization precious time and money. It's always more comfortable and enjoyable to work in a clean environment than it is to wade through piles of information to find what you're looking for. Unfortunately, poor organization can cripple an intranet, and if left to continue, engagement will only get worse. This is one of the primary reasons why intranets fail, and avoiding the issue is critical to success. One way to maintain overall organization is to delegate organizational tasks to one, or multiple employees, making intranet organization a community effort. "Search" is everything in an intranet. It allows you to find what you're looking for without jumping through a series of hoops, and you'd be lost without it. Some of today's social intranet software platforms come equipped with quality search engines that allow for various degrees of customization, but others come bundled with search features that are barely usable at all. If your employees can't search the intranet for a file or document with ease, they're going to get frustrated and employee engagement rates will fall. Alongside any issues related to how an intranet is organized, an ineffective intranet search engine will no doubt spell the end for any intranet. Intranet navigation should be instinctual. It should require such little work on the part of the user that it goes unnoticed altogether, as this is what makes for a smooth experience. Some intranets suffer from complicated navigational principles, however, which render them extremely difficult to use. Your staff is already challenged with learning how to incorporate a new intranet into their workday — so learning about complex navigation shouldn't be one of those challenges. There are many reasons why modern companies choose to deploy a social intranet, but one of the most common is for enhanced collaboration. Finding ways to streamline collaboration should be at the top of any manager's list of priorities, and the social intranet serves as an ideal platform to work from. However, intranets loose their value when employees don't collaborate effectively or are apprehensive about doing so. Communication can be the key to success and should never be allowed to fall apart. Ownership of the social intranet is an interesting thing. It is possible to effectively place ownership in the hands of the community itself. However, this type of process can cause issues if people don't know where to go when they run into roadblocks. Often, these challenges surface from a lack of proper attribution. Ownership is sometimes assumed to be in the hands of HR or Communications, but without any sort of clarification, the confusion that results can cause an intranet's performance to suffer. Within a social intranet, every user should have his or her own set of tasks. This is what allows employees to work together to reach a common goal, and it's essential to the growth of your intranet. Problems begin to arise, however, when tasks aren't communicated clearly enough. There's no need to place blame on anyone should this occur, but it's important to take action as soon as possible. Managerial staff should make sure that staff expectations are communicated thoroughly. In order for an intranet to be beneficial for an organization, it has to serve a number of clear purposes. Great strategy can make even the most mundane intranet platforms shine, whereas a lack of strategy will almost always lead to problems. Articulating strategy is important at all levels, as CEOs and managers should constantly remind themselves of the intranet goals they've set. At the same time, staff members need to have a strong handle on what they're working towards. Outlining an intranet content strategy in written form is the best method to follow, and the final product should undergo scrutiny by as many individuals as possible before being implemented. Autopilot is what happens when people get too comfortable, and it can happen just as easily to your social intranet as it can to your routine drive to work. If things are going well, this doesn't mean you can simply sit back and ignore any responsibilities associated with intranet administration. On the contrary, practicing mindfulness and paying close attention to how your intranet is functioning is a daily responsibility that should never go overlooked. Your intranet should be an entity unlike anything else associated with your organization, and this is where some companies fail. Between drives, CRM software, and other digital or physical spaces, shared information can often be found in a number of different places outside of your intranet. This makes logging into the social community each day less pressing than if it were the only space for shared information, and confusion can result as to where the most updated versions of files reside. The best practice here? Incorporate as many processes as possible into the social intranet, and get rid of alternative spaces that hold shared information. Quality control can make or break any organization, and there are a handful of different ways to approach it. This couldn't be more true for a social intranet, which can be expected to get filled with different types of content over time. However, if this content lacks quality, everything can fall apart. Quality content inspires staff members and leads to boosts in productivity. It takes a top writer, or handful of writers, to ensure high quality content, and no intranet is complete otherwise. If you can focus on outfitting your intranet with content of the highest quality, you'll have a strong foundation to work with. The intranet can serve many different functions but one of the most important is that of communication. People need to be able to communicate with each other in a streamlined fashion, and email isn't typically the best route to take. When a well-designed intranet chat system is in place, it can truly change things for the better. Typically, the social intranet software platform you choose will dictate how difficult, or easy, it is to communicate within the intranet. Therefore, making the right choice from the very beginning is crucial. When an intranet goes down, things come to a standstill. Employees can't communicate, projects cannot be updated, and a host of other issues can result. Sadly enough, many people experience more intranet downtime than they'd like to admit, which can really get in the way of achieving success. If an intranet goes down frequently, solving this issue should be listed as a top priority. Your intranet's news feed brings the community together. That is, if you're actually using it. You can post about company achievements, events, scheduled maintenance in the intranet, and everything in-between. The trick is to actually do it. One of the best ways to get an intranet news feed to where it needs to be is to delegate the task of updating it to one or more specific employees, which can take the pressure off of whoever is in charge of administration. There are always challenges that can get in the way of an intranet's success, but the good news is that the vast majority of these problems can be avoided with a little bit of work. By understanding why intranets fail, you can make sure it won't happen to yours.